This past weekend I was reminded of the episode of Little House on the Prairie, where Mrs. Oleson renamed the town Olesonville. 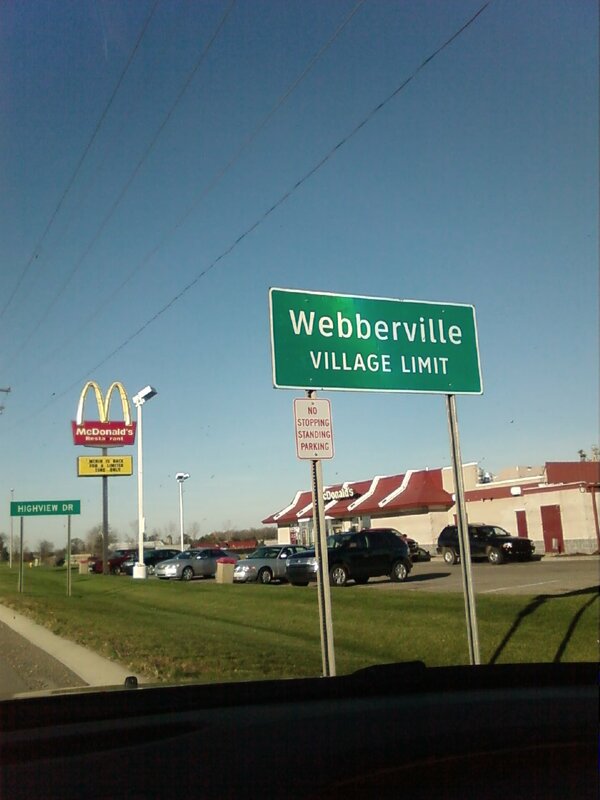 Mr. W was driving through Michigan and came across this town. And it’s spelled right! I can’t even tell you how many times people spell Webber as Weber. Way too many too count. It was such a nice discovery, and we joked all weekend about how we should move there and claim it as our own, but alas, we’re staying put. Do you know of a town with your same name? And don’t you just love Little House on the Prairie? And how cool is today's date? 11/11/11 Love it. 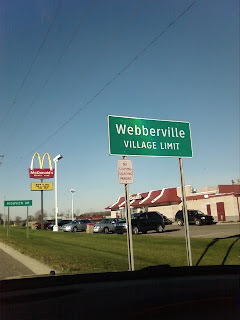 My brother-in-law lives near Webberville, so I'm pretty sure I've been through there before! As far as town names go...my last name is Gradowski. Yeah. I don't think I'm going to see a city with that name any time soon! My married name is Archer and there is an Archer City in Texas. I grew up in Texas, but if I ever visited Archer City, I don't recall it. As for my maiden name - Couzens - no towns with that name, but it was often misspelled - cousins. I loved Little House on the Prairie and sometimes still catch an episode on the Hallmark Channel. And today's date is cool. I'm an Army wife. So it really has special meaning for me. Happy Veterans Day to ALL who have served our country (including my great-grandfather, grandfather, my dad, my f-i-l, and now my son). So very grateful. My maiden name is Edmiston so it was misspelled constantly, as well as mispronounced. My married name is Mitchell - tons of places named Mitchell or Mitchellville. However, you would be surprised how many people manage to misspell Mitchell. A big Thank You to all veterans and their families today! My married name is Swigart and people out here in the Bible Belt automatically think Jimmy Swaggart and start spelling it that way without listening to me spell it for them. Ugh! Lol, great discovery, your very own town! Both my first and my last name are often misspelled, it should be Diana, but I sometimes read Diane or even Dianne. My lastname, nope, no chance on a town of my own. My married last name, nope, one of those that was changed from the original German and given a unique spelling and is often mispelled. My maiden name, no town, but a county in New York and a park on Staten Island. There is a road in Ohio named after my ancestors and one of my relatives lives on it! Ooh, Rebecca, I wonder if you're family's connected to that road somehow. Might be time to do a little digging! Uh-oh, Carol! At first glance, I thought the same thing. That must get so frustrating. Aurian, it is kind of neat. And there are so many ways to spell first names--I'm constantly asking at book signings for people to spell their names, even if it sounds simple. Cindy, my in-laws had a road named after them, too, and lived on it for years. It's such a neat piece of history, isn't it? My husband's last name is Rigby, and there is a Rigby, Idaho town. We drive through it sometimes on our way to Yellowstone. My last name is McDonald, so I see my name in pretty much every place...along with some yellow arches attached to it. :) Yes, I have always loved Little House on the Prairie. It was a favorite show growing up. And enjoy 11/11/11! No town discovered yet, but the street leading into San Diego Airport is my maiden name and DH's family has a 'holler' named after them in his part of Virginia.